Find the wireless network icon on your computer (on Windows, you'll find an icon that looks like 2 computers or a set of bars in your taskbar on the bottom right of your screen; Macs will have a wireless symbol in the top right of the screen). View available Wi-Fi networks by either right-clicking the icon and selecting "View Available Wireless Networks" (Windows XP) or by clicking the icon and selecting to "Connect or disconnect..." (Windows Vista). 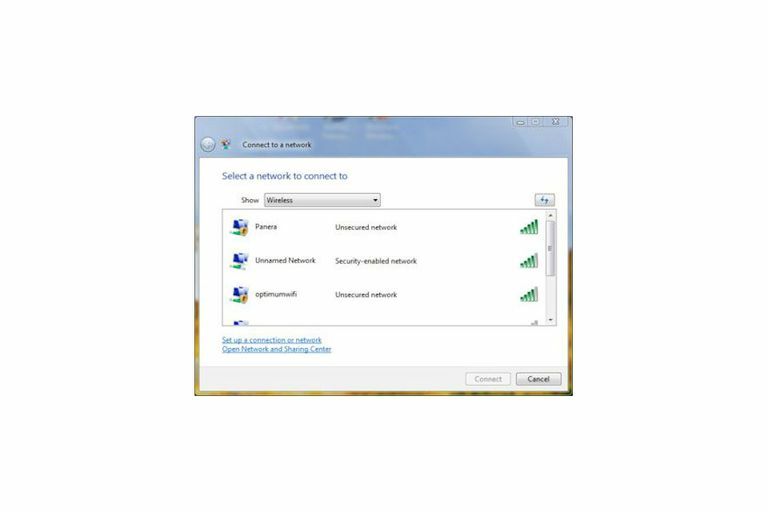 On Mac OS X and Windows 7, 8, and 10 all you have to do is click on the Wi-Fi icon (bottom right) to see the list of available networks. Choose the network to connect to by clicking the "Connect" button (or just selecting it on Winows/Mac). Enter the security key. If the wireless network is encrypted (with WEP, WPA or WPA2), you'll be prompted to enter the network password or passphrase. This will be stored for you for next time, so you'll only have to enter it once. On Windows, select the type of network this is. Windows automatically sets up security for different network location types (Home, Work, or Public). Start browsing or sharing! You should now be connected to the Wi-Fi network. Open your browser and visit a website to confirm the internet connection. Make sure you have a firewall and updated antivirus software especially if you're accessing a public Wi-Fi hotspot. Open or unsecured wireless networks are not safe at all. In Windows XP, make sure you have updated to SP3 so you have the latest WPA2 security drivers. Some wireless networks are set up to hide their SSID (or network name); if you don't find the Wi-Fi network in your list, ask someone at the establishment for the SSID information. If you are able to connect to the network but not the Internet, make sure your network adapter is set to automatically get its IP address from the router or try other wireless troubleshooting tips. If you can't find the wireless network icon, try going to your control panel (or system settings) and the network connections section then right-clicking on the Wireless Network Connection to "View Available Wireless Networks". If the wireless network you're looking for isn't in the list, you can manually add it by going to the wireless network connection properties as above and clicking on the selection to add a network. On Macs, click on the wireless icon, then "Join Another Network...". You'll have to enter the network name (SSID) and the security information (e.g., WPA password). You'll need a wireless network adapter installed in your laptop/computer. One I recommend is the Linksys AE 1000 High-Performance Wireless-N Adapter. It's ideal for both Windows desktop computers and laptops. Buy a Linksys AE 1000 High-Performance Wireless-N Adapter on Amazon.com.